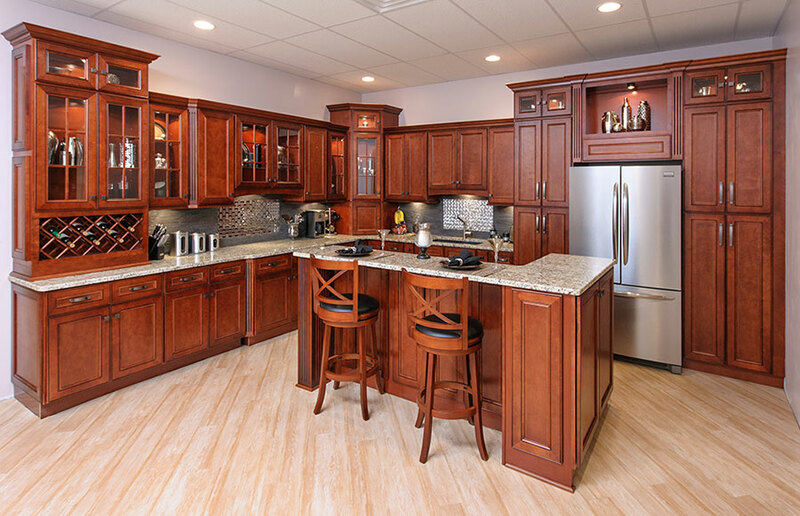 If you're looking for a touch of warmth and elegance, our York Cherry cabinet line is for you. The alluring cherry color of this cabinet line shows a beautiful fine grain that will give your cabinets character and unique personality. All of the door and drawer fronts in the York Cherry cabinet line have an applied molding detail and a black glazing that really makes the cherry color of the cabinets pop! Not only is our York Cherry cabinet line made with solid hardwood doors and face frames, it also comes standard with soft close door hinges and full extension under mount soft close drawer glides. No upgrading needed here! From countless cabinet sizes to a long list of accessories, our York Cherry cabinet line is sure to please.